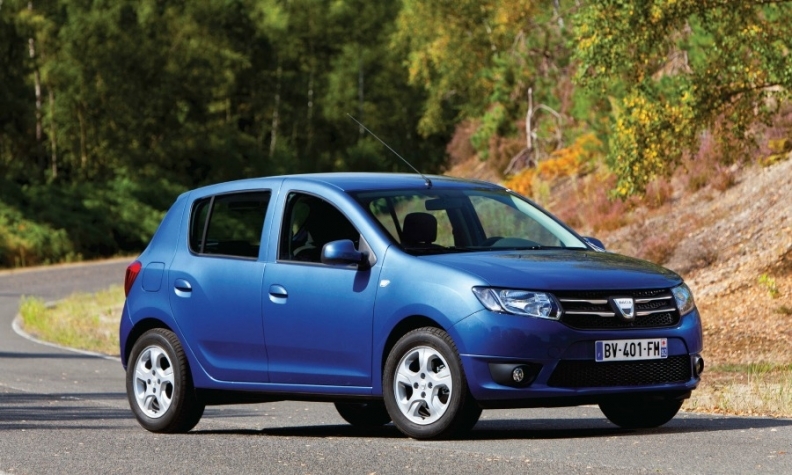 Low-cost models such as the Dacia Sandero hatchback helped Renault boost sales in Europe. PARIS (Bloomberg) -- Renault delivered 3 percent more vehicles globally last year as strong European sales of cars such as the Renault Captur and no-frills Dacia Sandero helped offset falling demand in Russia and South America. Global sales rose to 2.71 million cars and light commercial vehicles from 2.63 million a year earlier, the company said today in a statement. Deliveries of no-frills vehicles such as the Sandero, which is sold as a Dacia in Europe but as a Renault in Russia and many other markets, jumped 5 percent to 1.14 million. Renault Group relied on strong European demand for low-cost models such as the Sandero hatchback and Duster small SUV as a push into emerging markets backfired because of economic woes in Russia and Latin America. Dacia models and the new Renault Captur subcompact SUV helped the carmaker tap into a gradual recovery in its home region, where demand hit a two-decade low in 2013. Even with overall demand for new vehicles “uncertain,” Renault is predicting its sales will rise again this year, underpinned by “an accelerated product plan” with five new models slated to hit showrooms, Chief Performance Officer Jerome Stoll said in the statement. "We are forecasting an increase in our global volumes, the strengthening of our position in Europe and improvements in our positions on our main emerging markets," Stoll said. The company forecast that industrywide car sales this year will rise 1 percent to 2 percent in Europe and 2 percent globally. Renault’s home region propelled sales growth last year, with gains of 42 percent in the UK, 30 percent in Spain and 29 percent in Italy. Sales in Europe accounted for 54 percent of the company's volume, up from 50 percent a year ago. "Renault has done a good job in a tough market," said Arndt Ellinghorst, a London-based analyst at Evercore ISI. "They have managed to increase sales overall without giving up on pricing, which is what investors are looking at; 2015 has to be better than 2014." Deliveries in Russia, Renault’s third-biggest market, fell 7 percent to 194,500 vehicles, as a plunge in oil prices and a drop in the value of the ruble pushed Russia to the brink of a recession and caused the overall car market to drop 10 percent for the full year. Renault and its alliance partner, Nissan Motor Corp., together control AvtoVAZ, the maker of Lada models and the country’s largest auto producer. Renault’s deliveries in Argentina plunged 40 percent to 85,000 vehicles as the country’s currency struggles, while sales in Brazil, Renault’s second-biggest market, edged up by 0.3 percent to 237,000 cars. Stoll said Renault expects a 20 percent to 25 percent drop in the Russian car market, possibly another negative year in Brazil and no recovery in Argentina in 2015. The company's forecast for stability in its home market of France is "rather conservative," Stoll told a news conference today. In China, Renault recorded only 34,067 new registrations in 2014 as the automaker prepares to launch its first locally manufactured vehicles in 2016, a year after the creation of a joint venture with Dongfeng Motor. CEO Carlos Ghosn today said that Renault is capable of achieving a China market share of 6 percent. "In China, we will have a minimum of 3 percent and very likely 6 percent of the market," he said. "That's a lot of cars, and that means you can expect a massive investment program in China in the coming years."